This particular post is written in response to a Huffington Post article about being an “Allergy Mom.” How reading it made her think about the focus in the food allergy world about “parenting” with food allergies, managing it, rather than a conscious shift to TAKE ACTION. To change your allergy story. “It has always been about what we can do,” she says. Her sentiment echoes the exact feeling that those of us who have taken this large step forward believe, that making a choice to try treatment is an excellent way to parent with food allergies. When finding an amazing board-certified allergist (like Dr. Mayer for this family) who can treat you individually and adapt a protocol to your needs is too scary, is it because of YOU? Is being an “Allergy Mom” an important part of your identity? If the food allergy community could shift to discussing treatment and/or living positively, so many childrens’ lives would be improved for the better. This is a powerful post in their blog for any food allergy parent to read. I’m not hostile, confrontational, and certainly not intolerant – particularly of “Allergy Moms”. NO ONE understands that existence better than I. This photo collage is MY peanut allergic son eating 6 peanuts worth of peanut butter loaded with chocolate chips – just this morning. This is not some doctored set of photos. This isn’t Sunbutter. This is J-I-F. In my formerly nut-free kitchen. You can see my daughter’s paper “Princess” plate on the table along with her favorite “beach” cup. Her marginally clothed magnetic dress up girl is on the fridge. My son, as usual, has his favorite green cup. My box of Grape Nuts is still on the counter. This is REAL. This is our day. Every day. Twice a day. He’s not reacting. I don’t need Benadryl. I don’t need an Epipen. But while we’re nowhere near ready to call this a cure (I am. ), we can call this desensitization. My son can tolerate 6 whole peanuts. If he finishes the treatment, the restrictions will be lifted and he’ll be able to eat them whenever he wants. Yes, you read that right. Whenever. he. wants. But, while I have a child with food allergies, I am most certainly NOT an “Allergy Mom”. I don’t define myself as such and I would not allow anyone to define me that way either. I am Melissa, mother of two loons, and that’s that….among many other things. Allergy Mom is a definition I don’t want. It elicits pity. And if there’s one thing I don’t want under any circumstances, it’s pity. Neither does my son. Holy crepes, do NOT feel sorry for me or my son because he’s allergic to peanuts and tree nuts. There are worse afflictions to have. This treatment is absolutely not for everyone. There are some restrictions, and that’s not what I’m talking about. I’m talking about those for whom it can work. This post is also not against working toward the equality and fundamental rights of children with food allergies. It is not. At all. Don’t go there. My son is a homeschooler because the system is so skewed against him. I simply don’t have time for a learning curve with anyone. I can’t and won’t risk it. Period. So, yes, we have to ensure that our schools provide an equally safe learning environment for our children. Yes, we need to be sure that all parents/teachers/friends/students/acquaintances know and understand the protocol that should be used in the event of an emergency. Yes, we need to be vigilant, and teach our children to be equally vigilant about maintaining a nut-free environment. That’s a resounding yes to these aforementioned topics – among many, many others. But there is already so much discussion about life with food allergies. I get it. It’s important and necessary, but so is what we’re doing. That’s why I have to say something. Because so few people have my voice. As I read a recent article on HuffPost Parents yesterday, I have to say that I was sickened. It was absolutely the straw that broke the camel’s back. It was a post about what it’s like to be an ‘Allergy Mom’ and was the catalyst that finally caused all of this to precipitate out. And no, it’s not just her view. In fact, it has little to do with her. It’s only the most recent example, as I’ve read many, many articles over the last few months, and each one has fallen like coal into my fire. Right away, I’m sure you see my problem. So, let’s briefly talk about parenting with food allergies. I do it all day, every day, too. However, my perspective is infinitely different from hers. For me, it’s not about what we can’t do. I don’t even feel the slightest bit restricted by what my son can’t do. I’ve embraced it as a medical condition, accepted it, and moved on. It has always been about what we can do. We go trick-or-treating. We decline nut laden candy, remove cross contaminated candy, but we eat candy. That’s what matters. We eat Canadian KitKat’s vs. American KitKat’s, but we eat KitKat’s. That’s what matters. We carefully vet restaurants and staff before we eat out, but we eat out. Sure, I ask my buddy, “How ya doin’?”, but I don’t make a big stink about it. I’ve already alerted the staff, and we don’t eat at Chinese restaurants or places I consider minefields in the first place. That’s what matters. I carry $250 EpiPens, but I don’t tell you that. It sounds like a complaint to me. I carry EpiPens. They’re necessary. They save lives. That’s what matters. And I have never once considered this permanent. That also matters. Why NOT? Why is it NOT about curing, treating, studying food allergies? Isn’t that also part of parenting with food allergies? 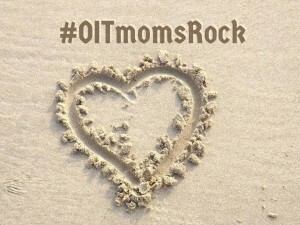 Let’s face it, most “Allergy Moms” who are capable of writing blog posts are involved in all sorts of allergy groups online, pretty internet savvy, and know about OIT. The writer of that particular post obviously has some inkling of these treatments or she wouldn’t have mentioned them AT ALL. Well, why isn’t it ever mentioned? Because OIT forces daily confrontation with the allergen. Possibly, but I’ll tell you what else I see and hear from those considering OIT. Sometimes it’s easier to stay IN DENIAL, right where you are, than it is to have faith in your ability to help your own child. I’ve heard from countless people who have canceled appointments and walked away from OIT simply out of fear. You have no idea how irrational I perceive this to be. Reactions are not a question of ‘if’, but ‘when’. We simply do not have the luxury of doing nothing. We can’t keep sweeping it under the rug and accepting the victimisation that comes with the overwhelming horror of food allergies. Wake up and hear me! Look at those pictures and see what I see. And before you even speculate that the reason OIT is working for us is that my son’s allergy isn’t off the charts, let me tell you something, he’s as allergic as they come. Don’t try and make this an impossible reality for you when it probably IS NOT. It’s a choice. It’s overcoming overwhelming fear – core shaking fear – and doing what is right. It’s about accepting and taking responsibility for one huge battle to avoid a war. Do you like being an Allergy Mom more than you like having a cure for your child? That’s a serious question. If you choose the former over the latter, why would I not assume that’s your preference? Because I don’t want to hear about how you can’t afford it. Where there’s a will, there’s a way. I would work 3 jobs, sell all my furniture, my house, by blog, and everything that has a monetary value to do this for my son. As it is, our insurance does NOT cover this treatment. Yes, we’re paying for it. I don’t care if you’re scared. I was scared. My son was scared. Let me say this – what might happen if he doesn’t do this treatment is a heck of a lot scarier than doing the treatment under extremely controlled circumstances. Your “other” doctor thinks it’s wrong. Yeah, so does my son’s “other” allergist. You know, the one who gives him allergy shots? He thinks we’re making a big mistake. He can’t say why. He just says it’s a mistake. So you decide, Allergy Mom. You see the pictures. Look at them again. Does it look like a mistake to you? I couldn’t keep convincing myself it was a mistake when I was constantly faced with pictures like this. That’s how we started the treatment in the first place. Find a doctor. Or I’ll find one for you.